This was a live by many minor idols, hosted by Takeda Mayumi. There were around 30 people in the crowd. I stood/sat on the right side along the wall in the back. 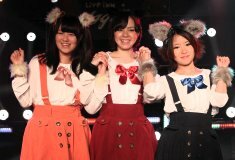 I went to see Chelsea, which is a subgroup of Maru Maru Gakuen Housoubu that sings k-pop songs. 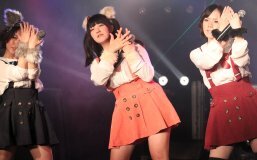 The members are Shiotsu Saori, Hino Kanako, and Tagaki Yuki. Chelsea was the first performer. Their stage was around 20 minutes, and they sang the following. After the songs there was a five minute talk with Mayumi. Chelsea wore a new outfit that they just bought a few days ago, a white blouse and a solid color skit with suspenders. The skirts were different colors, Saori red, Kanako orange, Yuki blue. They also wore cat ears, fluffy wristbands, and had cat tails. Saori's ears fell off while she was dancing. After Chelesa, the performers went as follows. Juri was a 20 year old college student who liked Onyanko Club songs. She sang four songs all related to Onyanko club. After all the songs there was a photo session. Each group stood in the middle of the stage for one minute. Then at the very end, every lined up in two rows for one minute. I ended up taking around 1000 photos, with around 340 worth keeping.